Freckles are a common facial skin problem found in females of almost all ages. They are round, flat, brown, sometimes reddish, spots that appear on your skin and are different sizes. Generally, light or fair skinned people are more prone to freckled skin. Freckles are usually of no medical consequence and do not cause any problems. However, most people want to eliminate the embarrassment and always aim for perfect skin. It can be very expensive to remove freckles medically, but you can easily get rid of them by trying several natural treatments at home. Home remedies to get rid of freckles include the use of sour cream, lemons, honey, castor oil, and horseradish in different forms. Try them to achieve a clear, smooth, radiant and flawless complexion forever. The lactic acid present in sour milk can help a lot to get rid of freckles. Therefore using sour cream as a face mask is highly recommended. Take about 3 teaspoons of sour cream and using a cotton ball apply it on the freckles. Leave the sour cream on the skin for 15 minutes and then remove using lukewarm water. Some moisturizer should be applied after that to keep the skin fresh and tender. You can also replace sour cream with yogurt instead. Castor oil is another natural remedy to treat freckles at home. 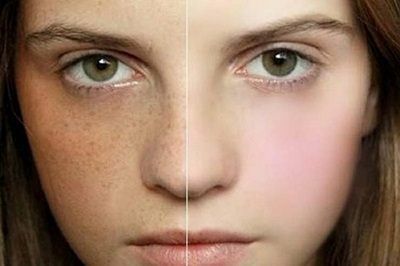 Using castor oil can help your freckles fade away and equalize your skin pigmentation. Before you go to bed at night apply castor oil to your freckles, no need to wash and rinse or mix and mash, just slather it on, go to sleep, and watch your freckles fade! You should make sure that you are using castor oil that is odorless. If you do not want to use castor oil you can use instead olive oil or vitamin E oil. Warm honey is one of the most effective home remedies for freckles. Honey has natural bleaching properties and can help reduce the excess production of melanin that causes freckles. Being natural, it does not cause any allergic reaction on skin. Make a mixture of water and honey and warm it before you put it on the freckles. Leave it on skin for 10 minutes and then wash off with warm water. Besides this, you can also apply a natural and herbal mask by mixing warm honey and wheat germ on your freckles and allow it to dry for at least ten minutes and rinse it with water. Do this daily for a several weeks. Lemon juice is a tried and tested remedy to get rid of freckles. With its lighting properties, lemon juice nicely lightens or bleaches your skin’s dark spots. You just need to squeeze fresh lemon juice and apply it on the affected skin and gently massage for ten to fifteen minutes. After this, rinse your face with lukewarm water. For effective results, you must do this twice a day. It has been reported that onions work effectively to remove freckles and brown spots due to their sulfur content which has exfoliative property. To get the best results you should use a red onion instead of a white or yellow onion. It is recommended to slice up an onion and rub them gently on your freckles two times a day. Repeat this remedy daily for one or two weeks you will start to see spotless skin. Horseradish is a fantastic herb that helps to remove age spots and freckles and makes your skin spotless. High amount of vitamin C in horseradish roots are responsible for its quality of minimizing scars and blemishes. Vitamin C or Ascorbic acid inhibits formation of melanin pigment. To use it on freckles, dab horseradish juice on the affected skin and let it sit for 10 minutes. After this, rinse with cold water. If possible apply this remedy on skin daily for at least one month and soon the brown spots and freckles will fade away. For this remedy you will need equal amount of sesame seeds and turmeric. Add just enough water to make a paste, and apply the paste to the freckles. Leave it on for 10 to 15 minutes and then rinse it off with cold water. This mask never fails to remove freckles from the skin. Well, try it yourself and experience the improvement.